TRA celebrates 5 year anniversary! 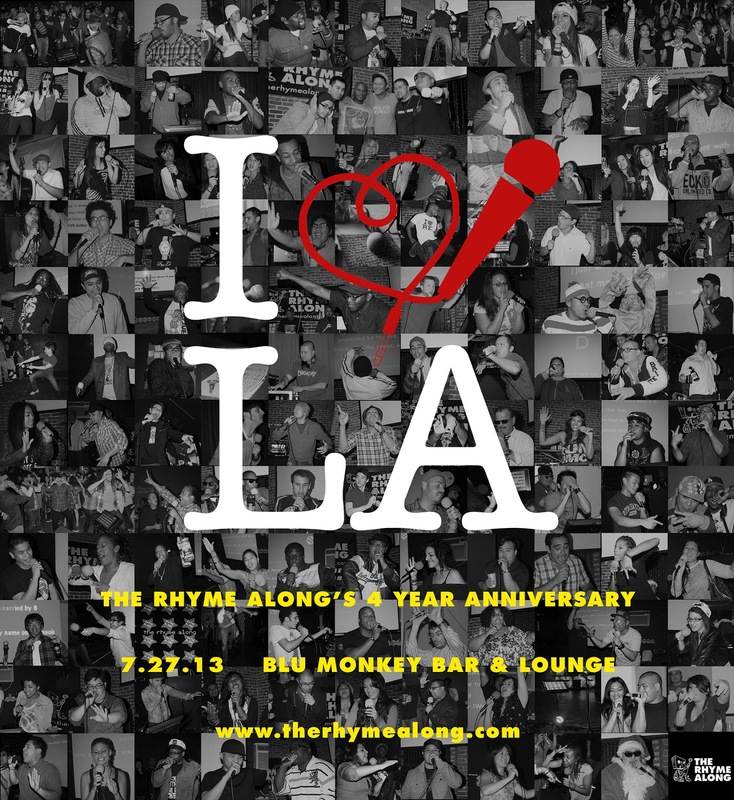 Celebrate the 5th year anniversary of LA's OG Hip Hop Karaoke back at our 2014 home - the Blu Monkey Bar & Lounge. 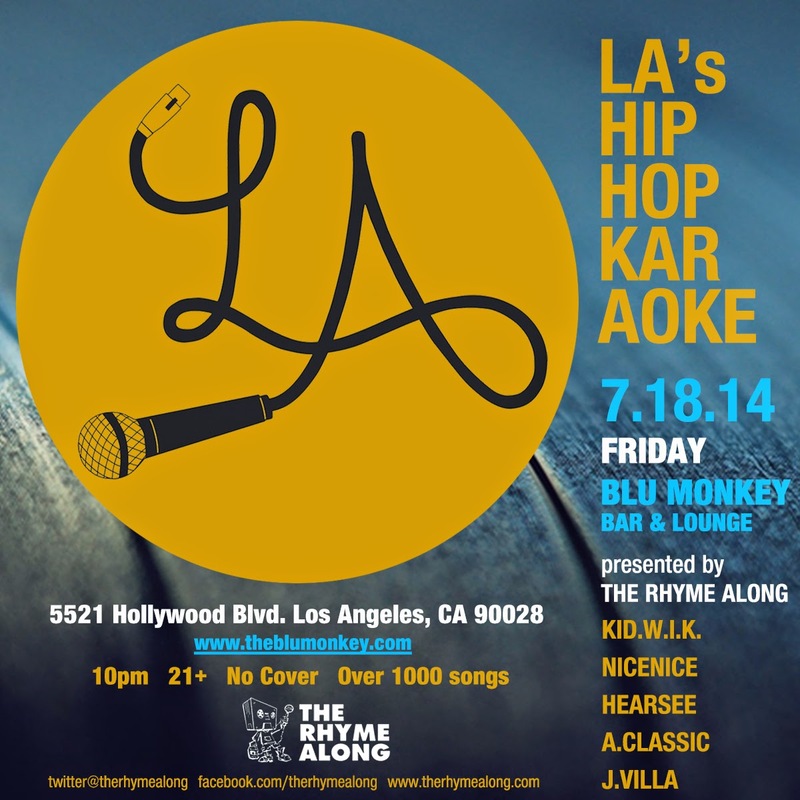 Rock the mic with your favorite rap songs complete with DJ and hype man! Our catalog has grown to more than 1000 Hip Hop Karaoke Videos ranging from Golden Era, to Nu & Tru-Skool, all produced ...by The Rhyme Along Collective. Early signups suggested on facebook, listen to some dope music spun by TRA's DJs Nicenice, Kid.W.I.K. and HearSee before we get started. Hosted/hype man by J.Villa and photo/vids by A-Classic. open invite - feel free to repost! An interactive installation inviting the audience to paint with light through the use of LEDs and projections. Using an LED spray can invented by Vince "hearsee" Calanoc, the artist applies light over transparent material creating the desired image. 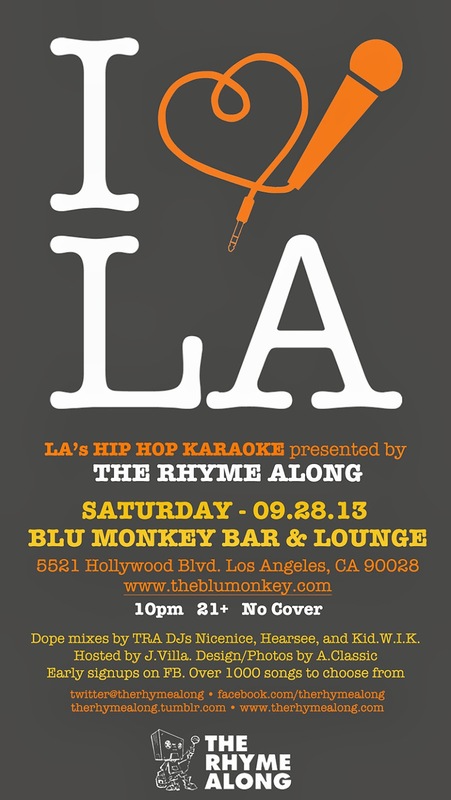 "How could I move the crowd, first of all, ain't no mistakes allowed"
Kick off fall with LA's OG Hip Hop Karaoke at our 2013 home - the Blu Monkey Bar & Lounge. Best performance (costume choice, song selection(s) and delivery) and crowd response (supporters in audience, twitter mentions, fb and ig likes) walks away with the pair of Yeezus tickets. Join the event (click going) on Facebook and #trayeezyticketgiveaway along with your song selection to enter the chance to see kendrick lamar at staples and oh yeah that Yeezy guy. "Im takin ya back come follow me, on a journey to see a for real MC"
LA's Hip Hop Karaoke is back for Labor Day Weekend at our 2013 home - the Blu Monkey Bar & Lounge. 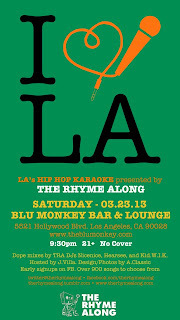 Rock the mic with your favorite rap songs complete with DJ and hype man! Our catalog has grown to more than 1000 Hip Hop Karaoke Videos ranging from Golden Era, to Nu & Tru-Skool, all produced by The Rhyme Along Collective. "Lets talk about time travelin, rhyme javelin, somethin mind unravelin"
LA's Hip Hop Karaoke is back for Memorial Day Weekend at our 2013 home - the Blu Monkey Bar & Lounge. Rock the mic with your favorite rap songs complete with DJ and hype man! Our catalog has grown to more than 850 Hip Hop Karaoke Videos ranging from Golden Era, to Nu & Tru-Skool, all produced ...by The Rhyme Along Collective. ... Voted #4 Best Karaoke Bar in LA Weekly! http://blogs.laweekly.com/westcoastsound/2012/02/best_karaoke_bars_los_angeles_la_2012.phpEarly signups suggested on facebook, listen to some dope music spun by TRA's DJs Nicenice, Kid.W.I.K. and HearSee before we get started. Hosted/hype man by J.Villa and photo/vids by A-Classic. LA's Hip Hop Karaoke is back for April at our 2013 home - the Blu Monkey Bar & Lounge. Who's the foot, I'm the foot, but who's steppin'? LA's Hip Hop Karaoke is back at it again for March at the Blu Monkey Bar & Lounge. 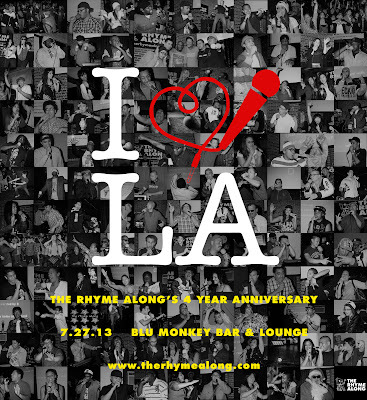 The Rhyme Along is a monthly event in Los Angeles featuring Hip Hop Karaoke Videos from the Golden Era, Classics, Nu & Tru-Skool. Look out for our next event on this site.